As intellectual circles, pastors and our so called ‘neutrals’ gather themselves in air-conditioned news channel studios and express their shock and awe at what they describe to be senseless attack on innocent citizens by Npp hoodlums and thugs under the guise of national security at Ayawaso West Wougon, the question that begs an answer is why has the same intellectuals, neutrals, the media, pastors, who have been pontificating on civil rights of citizens, kept quiet when these hoodlums started their activities in the country. We saw how they chastised the Mahama administration over less dreadful attacks but suddenly, completely ignored more vicious and brutal attacks on innocent citizens including judges, national security coordinators and government appointees. So why hasn’t anyone from the groups mentioned, asked the President and the Minister of State in charge of security, for immediate condemnation and explanation as they rightly sought for under Mahama? Why hasn’t the Rev. Prof Asante not spoken aggressively against this act, which constitutes a blot on our democracy? Why hasn’t our civil society organizations (some), condemned these unfortunate incidents just like they did under the previous administration? Why have such double standards been employed? Isn’t this a silent acknowledgement of the inherent biases in the media and civil society groups and our so called neutrals group towards a particular political tradition, class and community of people? I believe that such discrimination and open partiality will add to the ever increasing polarisation of our country and demonstrate how politically coloured these groups have become. The question really is whether this is healthy for our democracy. The answer is a resounding No. Democracies are always representative of a harmonious marriage between majority rule and minority rights. Theoretically, every law in our country and every provision of the Ghanaian constitution attempts to achieve this balance and egalitarianism. People like Rawlings, Kufour, Mills and Mahama infused life into these theoretical structures and attempted to put theories of social and political justice and equanimity into practice. But today, we as a democracy, guided by agenda driven, propagandist media ideologies tinged with inherent right winged flavour, seem to be shifting towards a norm that ‘might is right’. This I am afraid will reduce our democracy into mobocracy. I am struggling to understand why those who have issues with former President Mahama’s ‘boot for boot’ statement, cannot tell President Akufo Addo that his endorsement of these vigilante groups and their activities is rendering mandated democratic institutions including our police and military irrelevant due to the systemic eroding of public confidence in them. Paradoxically, some of our pastors, so called neutrals and the Chairman of the Peace Council, pretend to be sentinels of public good and paragons of moral rectitude. In their hypocrisy, they ignore their own moral problems and make us believe that they have the moral authority to lecture Ghanaians on morality. In his denunciation of hypocrisy, Jesus Christ urged the hypocrite to first cast out the beam out of thine eye” before offering to pull out the mote out of of your brother’s eye” . What did the Chairman of the Peace Council say in his capacity as a man of God to Nana Akufo Addo when the latter made his “all die be die” statement, when he threatened the President then Prof Mills that he will unleash on us his militants if the state fails to give him the protection he deserved, what about his Akanfoc statement??? The danger is that, this trend began when the Npp was in opposition. The party’s elected chairman and General Secretary were undemocratically removed from office because they had challenged the importation of mercenaries from South Africa and Serbia by Akufo Addo and his team. I have listened to Rev Prof Asante’s admonishment in relation to former President Mahama’s boot for boot statement. If a hypocrite can first remove the beam in his own eyes, he will see clearly, and consequently, realise that there was really nothing in the brother’s eye. 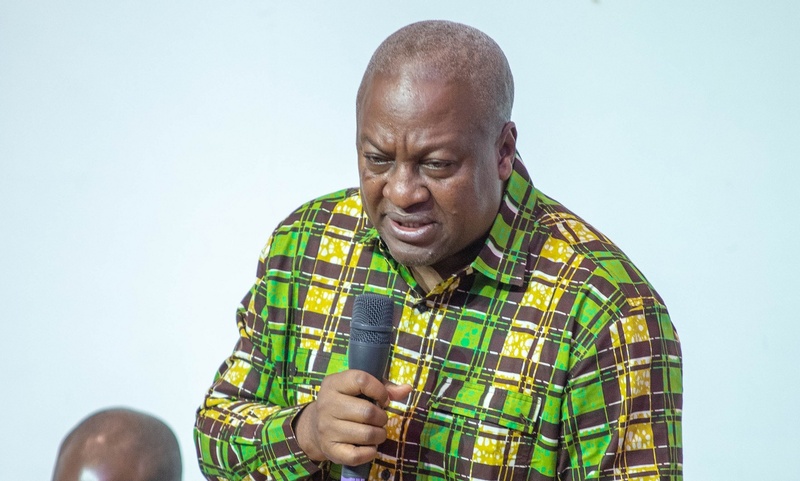 He thought there was a mote in John Mahama’s eye because what was in his own eyes was obstructing his vision, bad therefore distorting his perception and sense of judgment. Isn’t it hypocritical that the Chairman of the Peace Council will not comment on the atrocities meted out to supporters of the NDC, a Parliamentarian and innocent citizens but will quickly find his voice to vehemently condemn former President Mahama for his boot for boot statement. What happened at Ayawaso West Wougon lend credence to the claim by the NDC and its sympathisers that President Akufo Addo, the NPP, heads of the security agencies and two of the recently appointed EC commissioners are clandestinely plotting to rig the 2020 election. It also lend credence to the accusation that government has launched a witch hunt against activists and functionaries of the opposition NDC. These developments should be the worry of the man we paying from our taxes to ensure peace in the country. Some of these hypocrites joined the Npp to attack President Mahama and his government for borrowing for infrastructure. They were not interested in the massive infrastructural development the administration implemented, the were not interested in the hospitals and schools the administration provided for the people, their focus was on the lies their political friends we preaching across the country. Ghanaians are yet to hear these hypothetical voices on Ghana’s current debt stock of Ghc 172 billion. We are yet to hear them ask government to tell Ghanaians projects implemented from the over Ghc 60 billion borrowed so far. These hypocrites accused President Mahama of running family and friends government because he appointed an auntie’s daughter Joyce Bawa into his government. These hypocrites see nothing wrong with the appointment of over 60 family members of the President to juicy positions in his government. Suddenly, appointment of in-laws, former wives by the President and his Vice into government is normal and acceptable. They see nothing wrong with the human right abuses and constitutional violations by this government. They saw everything wrong with the bus branding saga, joined the opposition them to bury the Mahama administration over the bus branding deal. We heard their strong voices on Wayome, Gyeda, Sada etc. But these hypocrites are yet to comment on the Kelni GVG scandal, the National Lottery Authority scandal, the Ghana Maritime Authority scandal, the Bost scandal, the Oslo deal, the drones deal, the addressing system, constant breaching of procurement procedure, etc. Moral hypocrisy is still worth exposing, I guess. But we are living in a moment when revealing the hypocrisy of our so called neutrals and intellectuals should take precedence. Most of these so called neutrals and self made opinion leaders in the country can best be described as celebrity intellectuals who always seek to gain face and not lose face. Simply put, they make a point of always being at the right place at a particular moment, to offer the media soundbite that their political friends demands. They include some so called experts and resource persons who really have nothing constructive or useful to contribute, but for whom Brown envelops and political appointment are the main objective.